PS. I got a new FALL BANNER on my blog!! Did you see it? Click over here if you are on a reader or facebook! Made by my friend Jamie @ JYL Creative, he created my original banner and fall-i-fied it for me this week! I like simple and subtle transitions between seasons. September is early fall to me. 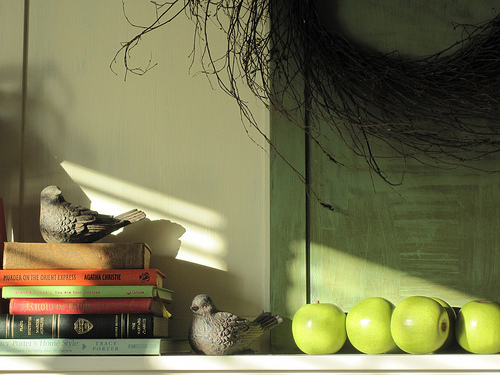 I like to see the warm fall light pouring in on my books and apples on the mantel. That was my mantel last September. 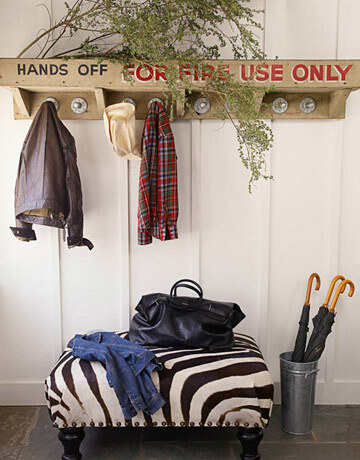 While I love simple, my style isn’t minimalist at all, but it isn’t fussy in a crafty sort of way either. Not that crafty is bad, it just isn’t me. The fact that I have those shutters and lots of frames on the walls mean I need to be careful to not overdo the mantel. So, I just stacked some fall looking books on the mantel and called it good. This is my mantel right now, in September, I know you’ve already seen it a couple of times. I might not have pumpkins yet, but books FEEL like fall to me so in my mind, that is enough for September. Pumpkins and gourds might be set out in October. I love evolving through the seasons and keeping things fresh. Each month is almost like its own special season that way. I’ve had that wreath up for two Fall seasons now. Maybe I’ll change it in a month or so, but maybe not. It still works. 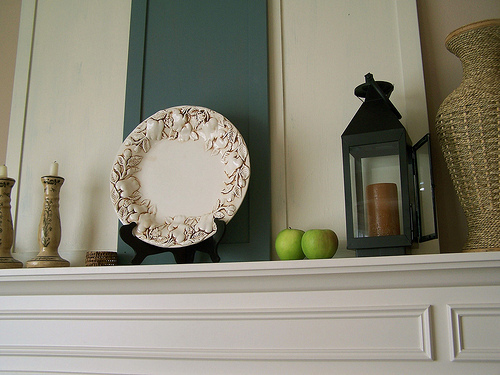 Before I painted my shutter green, I had another simple early fall mantel. I forgot to light the candles, but how pretty it would be with the candles flickering! I can easily add a white or colored pumpkin or gourds in October to let the mantel evolve. I saw this mantel over at Better Homes & Gardens. 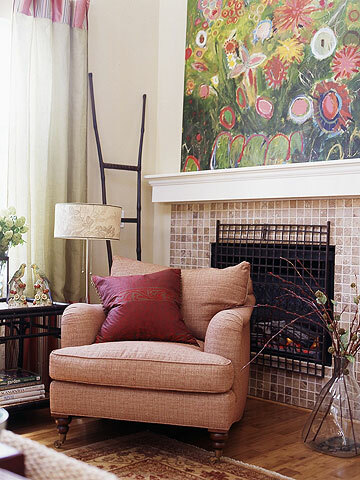 It isn’t really a fall mantel, but look how simple it is with just one large painting. By putting a few twigs in a jar on the floor nearby and a warm fire in the fireplace, you get a sense of the season. 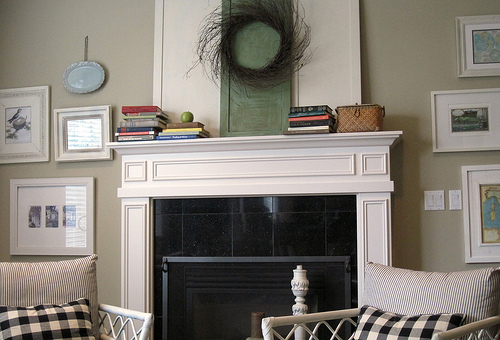 Sometimes mantels feel a little overdone, so a few twigs in a jar on the hearth can be refreshing. 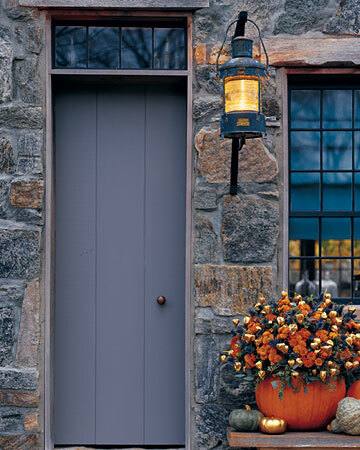 Fall decor doesn’t have to mean orange pumpkins. 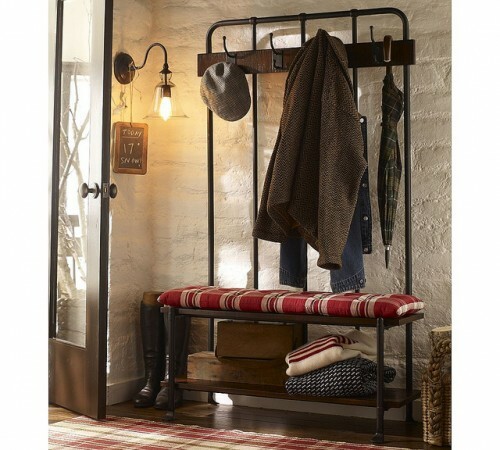 Or, what about this mantel from Better Homes & Gardens? Again, it is simple. The little bouquets of orange are just enough for this refreshing and subtle style. No pumpkins, no corn, no typical fall decor, but it is fresh and pretty. The logs in the fireplace signal the season in a simple and subtle way as well. That is all I’ve got for now. 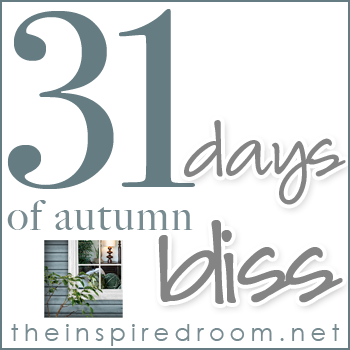 I have to get back to writing my 31 posts…see you October 1 for 31 Days of Autumn Bliss! 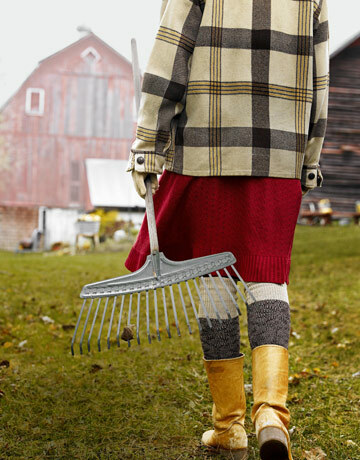 Do you put out all your Fall decor in September, or do you evolve a little each month? There is no right or wrong way to do it! I linked up to Nester’s Fall Mantel party and Julia’s Fall Decorating party!